"Thank you for facilitating a workable and mutually agreeable solution to our stalemate. It was amazing to observe you navigate the groups. Amazing!" Cindy Cook’s twenty-plus years of working with groups to resolve complex environmental and public policy issues has earned her an outstanding reputation with a broad range of stakeholders who have interests in environmental and land use issues. She easily navigates the cultural waters of local, state, and federal government agencies, corporations, and non-profit organizations, and facilitates conversations that result in collaboration and agreement. Cindy is national leader in the field of environmental dispute resolution and group facilitation. She has a degree in Anthropology and Economics from Yale, and served as an Act 250 Coordinator for the Vermont Environmental Board for seven years. She served as Vice President of the Association for Conflict Resolution, and is Past Co-Chair of ACR's Environment and Public Policy Section. 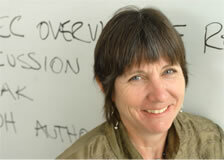 Cindy is a Fellow of the Vermont Law School's Land Use Institute, and is a frequent speaker at national conferences.